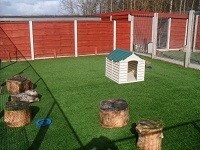 Doggy Daycare Manchester boarding only £10 per dog per day and £7.50 per additional dog per day from the same family. There are various options available, regular day boarders where you bring your dog early in the morning 8.30am so you can still get to work on time and then collect your dog at 5.30pm or before (please contact us to discuss your needs). 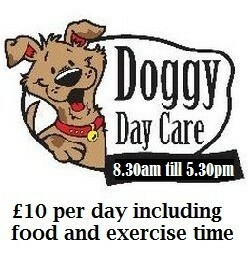 As a one off day boarder this is great service if you are going off for the day or half a day, if you have that all important meeting or just fancy a day of shopping and just need to know that your dog is in good hands and being exercised regularly. We have exercise/play areas with plenty of toys (all dogs exercised individually) and then afterwards your dog can relax in his own kennel. Manchester Kennels © 2019. All Rights Reserved.